A scene from Massenet’s “Manon” with Ellie Dehn in the title role and Timothy Mix as de Brétigny. Photo Credit: Cory Weaver/San Francisco Opera. To appreciate Jules Massanet’s great Belle Epoch masterpiece, it is helpful to recall that it was in this gilded period that Paris made its reputation as the most romantic city in the world. In those years, the French perfected a bubbly drink called “champagne, ” Escoffier ran the dining room at the Hotel Ritz, and Eiffel constructed his tower. Musically, “Manon” is more charming than memorable, but it does feature lovely long melodic lines that are always easy listening. Performed well, the music is engaging throughout. In the current production, it is all performed better than well, especially the choral sequences beautifully directed by Ian Robertson. Conductor Patrick Fournillier coaxes maximum charm from every phrase. There can be no complaints. 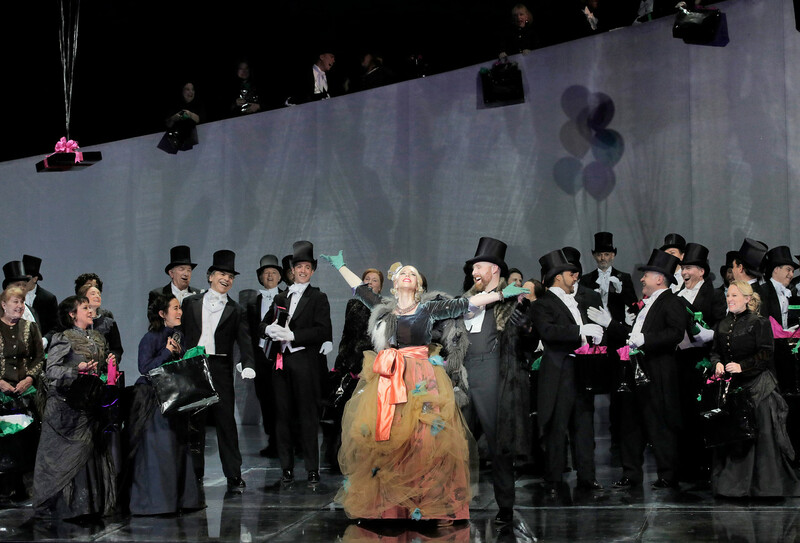 The true excellence of this production is in the superb chemistry between Michael Fabiano’s Chevalier des Grieux and Ellie Dehn’s Manon Lescaut. Fabiano is well on his way to becoming a truly legendary tenor and his romantic charm and outstanding acting skills are on full dispay here. The marvelous Ellie Dehn, known for her expertise in the Mozart repoertoire, makes her role debut as Manon in this production, and she no doubt will give many a command performance in years to come. Together, Fabiano and Dehn create a marvelous portrayal of true love, although, of course, Manon seems to be perhaps too frivolous to be truly kind. In the end, she dies quite beautifully if not quite tragically. Also striking is the delightful set design and staging. Designer Vincent Lemaire has a gift for metaphor. His raked stage leaves all of the elegant characters just a bit off balance, reminding us of how easily they can fall away from their charmed lives with just one unlucky night at the gambling table. In a really spectacular effect, Manon balances herself precariously on a high banister while hanging onto a large bouquet of helium-filled balloons. In a moment anticipating her future fall from life, she steps off the high banister to the stage below, floating beneath the balloons like Mary Poppins under an umbrella. It is very charming. Rounding out this bonbon of an opera are a number of graceful small and comic performances, including a very funny bit by Anders Fröhlich as a haughty innkeeper, and a funny and well-sung performance by Robert Brubaker as the buffoonish old womanizer, Guillot de Morfontaine. “Manon” continues at the War Memorial Opera House through November 22. For further information click here. “Manon” by Jules Massenet. Libretto by Henri Meilhac and Philippe Gille. Based on the novel “L’histoire du chevalier des Grieux et de Manon Lescaut,” by Abbé Prévost. Conductor: Patrick Fournillier. Director: Vincent Boussard. Set Designer: Vincent Lemaire. Costume Designer: Vincent Boussard. Lighting Designer: Gary Marder. Chorus Director: Ian Robertson. DanceMaster: Lawrence Pech. Thoughtful and accurate review of a brilliant priduction. Thankyou, Judith, for taking the time to leave this kind comment. Much appreciated!